A shadowy organization called Larrabee Development Group has set a most ambitious goal: unseating AMD/ATI and Nvidia as the largest producers of high-end graphics chips. And it might just succeed. It may seem unfathomable for an unknown such as Larrabee to knock off two of the most powerful processor companies. That is until you realize that Larrabee is little more than a weak disguise for Intel. The chip giant has, in fact, ramped up its graphics efforts in recent weeks to create a product code-named Larrabee theoretically capable of besting AMD and Nvidia's best kit. 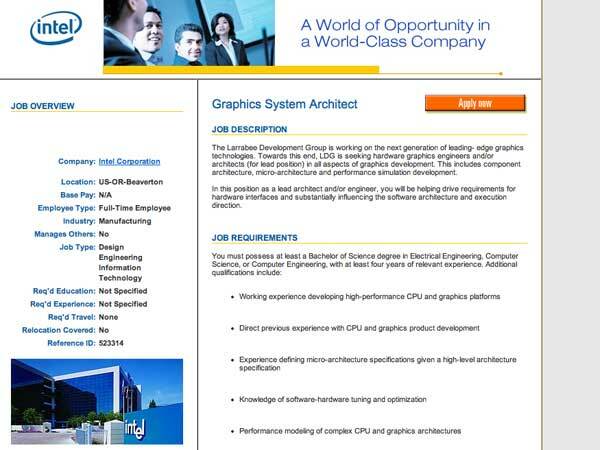 Intel over the past couple of months has peppered job boards with ads for the Larrabee Development Group - a company "working on the next generation of leading- edge graphics technologies. Towards this end, LDG is seeking hardware graphics engineers and/or architects (for lead position) in all aspects of graphics development. This includes component architecture, micro-architecture and performance simulation development." Recently, Intel has stepped up the Larrabee effort even more with our sources saying the project has shifted from bet hedging to a whole-hearted push. Insiders have also confirmed that Intel has amassed "a crack team" of graphics chip experts behind Larrabee.These engineers may very well hold Intel's future and the future of PC and server chips in their brains. So-called GPGPUs or general purpose graphics chips have become all the rage in the processor industry. Such chips take advantage of the tremendous performance gains made by the likes of ATI and Nvidia by tweaking GPUs to handle non-graphics software loads. So far, the technical computing crowd with math-heavy software have shown the most interest in the technology. ATI and Nvidia have obliged by rolling out what amount to test boards that can help foster the software work. Eventually, however, GPGPUs could stretch to handle a broader set of software applicable to consumers and business customers. AMD's purchase of ATI, and Nvidia's apparent reluctance to be acquired have left Intel as an odd man out in the GPGPU race. Without question, you can see AMD and Nvidia hoping to raise the prominence of GPUs in the broader processor landscape. This pursuit could take the form of GPGPUs alone or it could evolve into a push that places the most attention on the GPU and then presents standard x86 chips as secondary engines. Such a future would not be in keeping with Intel's historical interests given the company's focus on complementary rather than standalone graphics. Larrabee has the potential to bring Intel in step with rivals by giving it either a full-fledged GPGPU board or simply a graphics-rich add-on to its current CPU lines. Intel appears to be leaning toward the latter option if CEO Paul Otellini's comments at the recent Intel Developer Forum are any indication. When asked if Intel planned to mimic AMD by adding more graphics oomph to its CPUs, Otellini responded with a curt, "The short answer is ‘yes.’ That’s the only answer I’m giving. Next question." On one level, there's a real sense of urgency behind the Larrabee project. GPGPUs garner plenty of attention today and will earn even more press by early 2008 when AMD and Nvidia rollout products that support double precision (64-bit) floating point operations. The move to double precision should give GPGPUs an even greater performance boost on high performance computing workloads. However, the dash of realism that seems to be missing from all the GPGPU hype is the software problem at hand. A vast army of coders will need to embrace the GPGPU model and re-craft software to suit the processors. Such efforts always take longer than expected. So while ATI and Nvidia may have hoped to relegate the CPU to a secondary status in the near-term, such a shift could take years and years. Exactly how Intel is reading this software transition remains to be seen.